This is part four of a multi-part series titled “Limiting Factors – A Genesis of Blood Doping”. It comes to FasterSkier from Sammy Izdatyev. You can read part one here, part two here, part three here, and part four here. When Björn Ekblom’s opinion of his 1972 paper was that more research was needed in the arena of blood doping to understand nuances of the subjects, this was to be the case even up to our days. Even when the efficacy of blood doping became the mainstream view by the 1980s, Björn Ekblom’s research on in the arena of blood doping and on the limiting factors of maximal oxygen uptake didn’t end there and his research in both arenas is very extensive. 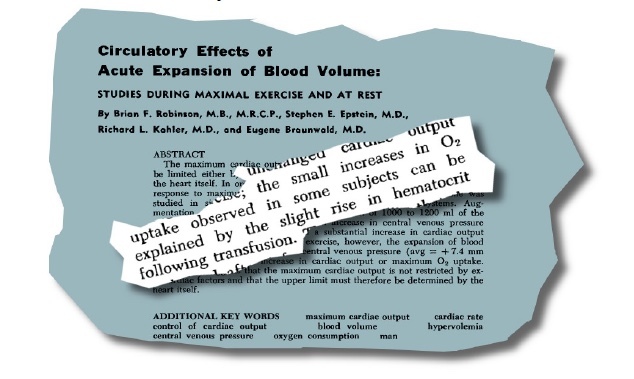 The results were actually different than what Ekblom had written earlier because even when after dilution (dextrose infusion) each given unit of blood carried less blood, Vo2Max tended to remain the same because body increased cardiac output, indicating that total hemoglobin was more important for Vo2Max than concentration as such. Still working capacity was slightly lower after dilution. One unintentional conclusion for future blood dopers was that blood dilution was quite an effective in masking blood-doping induced elevation of total hemoglobin, because if one compares the subjects after they had been treated with blood infusion and saline, all the relevant parameters such as total hemoglobin (+6 %), Vo2Max (+ 4 %) and time-to-exhaustion (+13 %) are higher when compared to the control level indicating that they get almost full benefit of the extra RBCs. But the dextrose infusion clearly hides that the blood infusion took place because resting hemoglobin concentration is actually some 7 % lower than the original value (13.7 g/dl vs. 14.7 g/dl). 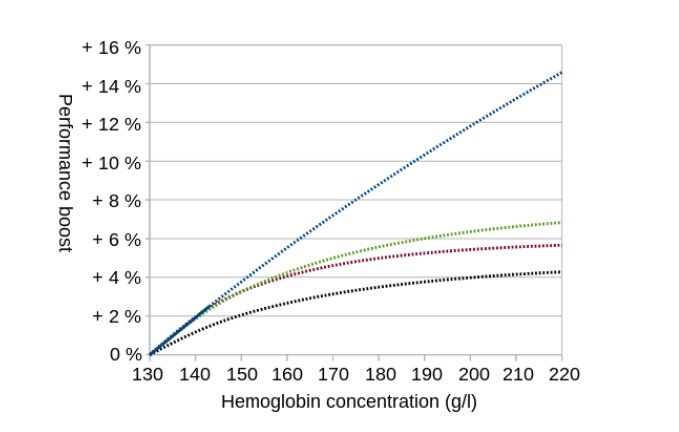 Another item of interest was the theory of optimal hematocrit, the presumed ”best” value from oxygen delivery viewpoint which was assumed to be roughly hematocrit value of 45 % corresponding hemoglobin concentration of 150 g/l. While particularly Anglo-Saxon blood doping researchers were interested in the optimal hematocrit issue, there is barely a word of speculation about the ”real” optimal hematocrit in any of Ekblom’s writings. To research this, Ekblom and his coauthors researched how reinfusion of five blood bags (2250 ml) affected Vo2Max and took intentionally subjects with a large variation in their natural values. When a subject with a hemoglobin value of 178 g/l donated blood, his Vo2Max fell significantly even when his Vo2Max could’ve been increased had the optimal value of 150 g/l had any validity. ”The same subject increased his maximal oxygen uptake after the same linear pattern when [Hb] was raised above 200 g/l as one individual with a normal [Hb] around 120 g/l”, the authors observe somewhat surprisingly. (Celsing et al, 1987) It doesn’t automatically follow that if the 120 g/l subject would increase his/her hemoglobin to 200 g/l that Vo2Max would increase linearly all the way through, only that the baseline value is only somewhat unimportant. It could be that every red blood cell increased performance up dangerous zones of blood thickness, and sometimes the ”higher-the-better” idea became the consensus view of the sports circles, true or not. The viscosity theory and optimal hematocrit value have been of great interest to many blood doping researchers and commentators. Björn Ekblom didn’t find the discussion about ”optimal hematocrit” to be fruitful and his findings questioned whether there was any universal one. Not every second athlete could reinfuse five blood bags, but the implication was still troubling, particularly when the prestigious New England Journal of Medicine published brand new information about the new hormone erythropoietin in its January 1987 issue, the exact same month as Ekblom’s newest research was published. When the advent of a synthetic version of hormone erythropoietin sent shockwaves to the sports world in the late 1980s, it still wasn’t quite certain whether a gradual increase in hemoglobin concentration elicited a similar effect as an instant increase. As it is well known, erythropoietin speeds up the production of red blood cells in bone marrow, but it takes weeks until hemoglobin concentration is increased and the human system bolsters mechanisms to fight against this increase if red blood cells are increased above natural level. While scientists of other countries were interested in the issue as well, Björn Ekblom was the first scientist to research how the red blood cell hormone affected sports performance, when he gathered a group of volunteers with anti-doping specialist Bo Berglund and injected them regularly with the hormone and subjected them to various tests, including Vo2Max and endurance tests. The results showed that there was little difference between blood transfusion and administration of synthetic erythropoietin (rHuEPO) and both blood doping methods improved performance in an almost identical manner regardless of whether the increase in hemoglobin concentration was gradual (hormone) or instant (autotransfusion). (Ekblom & Berglund, 1991) ”This wasn’t unexpected, but still horrible”, Ekblom described the findings to journalist Omar Magnergård who had written one of the first articles about blood doping almost two decades earlier. ”It also makes it difficult to believe in the future of sports”. (Magnergård, 1989) Ekblom was particularly shocked that only a handful of injections could boost performance so much. Despite the pessimism of the early-1970s, Ekblom had predicted in the early 1980s that the method to detect autotransfusions would be developed by the 1988 Olympics if there was proper funding and whereas his coauthor Bo Berglund had participated into detection of blood doping with athlete’s own blood, the research ended when EPO replaced transfusions almost altogether by the 1990s. Now Ekblom took part in the scientific research to develop a method to detect the abuse of the hormone and the team concluded that it was possible to differentiate the natural and synthetic version of the hormone in urine. The method researched and published in 1995 by a group of exclusively Swedish researchers was based on differences of electric charge between naturally occurring hormone and the synthetic version manufactured in a laboratory. “The method became approved by the journal, but was never used because it was expensive and took up to three days to use being unusable at an Olympics games, championships, etc.”, Ekblom recalls the limitation. When the idea of how blood doping could even be detected was beyond anyone’s imagination when the issue was discussed first time in media in 1971, there were various approached proposed by the late 1980s and when it became clear that blood samples would be drawn, there was optimism that a few blood samples with good parameters would reveal its abuse. These hopes turned out to be futile even when indirect monitoring of the blood of athletes have at least curtailed the excessive use. While most of the modern detection methods have been based on how the body reacts to the shortage (blood removal) or abundance (blood reinfusion) of red blood cells, Ekblom’s student and friend Christer Malm from the Umeå University took another type of approach on the issue, looking exactly the blood itself changed during the storage period. While there hasn’t yet been a breakthrough and the first peer-reviewed published paper showed that the method wasn’t completed, Björn Ekblom is today certain that there will be a method that will detect the abuse. “It feels very good that there will be a method that detects autotransfusions to a 100% degree”, he sees the future prospects of the work of Christer Malm. Innovator or conveyer or zeitgeist? As expressed throughout the essay, Björn Ekblom and Per-Olof Åstrand have always maintained that “blood doping” was only as a scientific venue and that the sports application was only an unpleasant ”byproduct” of this research. While there is almost something biblical about a venomous serpent causing the chain of events that led blood doping to be invented, Ekblom sees that his role in the research is almost accidental and that he was only conveying the ideas of the zeitgeist of the 1960s, because other researchers had also access to the same pre-existing data. “Probably somebody else would’ve done this experiment around that time”, Ekblom thinks modestly about the significance of this blood doping work. “It would be natural that people would think of infusing blood to boost performance. That was something natural at that time”. Based on the lukewarm reception and the skepticism and on the fact that it took until 10 years before the consensus view shifted conclusively towards the opinion that the method worked, it isn’t that certain how many years attempt in another place would’ve taken. On the other hand, it is true that altitude trained athletes started to break their way into the Olympic arena from late 1960’s onward and athletes showing interest in altitude training, it is possible that the method would’ve been invented even had the research not taken place in Sweden, if the method wasn’t already been “invented” accidentally or in a clandestine research somewhere. No – I had no idea that this would gather such a speed. I’ve been on the first page in Sports Illustrated which many would give their left hand for. Not even Bengt Saltin or Peo Åstrand has done so. Not that I think it is important – it is more than strange and also shows how the results of the research became taken by the mass media. In the summer of 2005 I conducted with a student a little pilot study with administering nitrate on GIH students. We measured many things and the effect was not noticeable except one thing – average blood pressure fell by about 3 mm. Some half years later a little article was published in the New England Journal of Medicine – which is the world’s respected medical journal. Today there are propably some 1000 articles on the effect of nitrate administration on performance, health and mental capabilities. The subject has even its own sessions in large conferences. This history is very similar to that of blood doping, if not bigger. Ekblom finds this research line “historically very interesting”, and since then, almost every other endurance athletes consume beetroot juice, and there has been research on the effect of nitrates on various other things such as efficiency. And one should remember that despite the meshing of science and sport with its questionable byproducts, the world of endurance sports wasn’t a pristine paradise before blood doping was invented, and blood doping didn’t “end” it altogether even when there are time periods and sports where it became more a rule than an exception particularly after the introduction of the blood-boosting hormone erythropoietin commonly known as EPO. Then how much does blood doping increase performance? This is somewhat surprising because blood doping considered to be an effective way to boost performance. In fact the handful of published research papers have showed some 2-5 % improvements in time-trial type of performance when hemoglobin concentrations have been increased only by some 10-15 % keeping the values within the healthy ”normal range”, which is in itself an enormous benefit in a race where differences between are usually are occasionally fragments of one percent. If it is known through research that 10 % increase in hemoglobin concentration (blue solid line) boosts performance by 2.5 %, does it follow that performance increases by a similar amount with each consecutive 10 % increase with elite level athletes? Not necessarily, because the “baseline” boost can be lower with elite level athletes and the other links in the oxygen-delivery chain can’t necessarily keep up with the extra RBCs after a certain point causing diminishing marginal gains (green, red and black line). I am not sure about how the other links can keep up. If you go from 140 or 150 g/l to 220 g/l, there must be some compensation in the distribution of flow or perhaps increased blood pressure and so forth. Björn Ekblom has always maintained that peripheral factors don’t appear to be the main limiting factor if enough muscle mass is recruited, which is illustrated by the fact that maximal ”forced” breathing is almost always higher than the highest values reached during exhaustive exercise points that there is ”idle” capacity in lungs and in addition, the blood returning from the muscles has a very low oxygen concentration, so the oxygen is pretty completely used at the peripheral level. While blood doping with all the methods has consistently elevated performance in the research papers and Ekblom always has stressed that heart and hemoglobin concentration are the main bottlenecks for most of the people most of the time, it is interesting that Björn Ekblom has occasionally discussed the possibility that the physiology of elites might be different and the key limiting factor might not be the heart and oxygen carrying capacity with elite level athletes. I am not sure about Eero Mäntyranta. His superior ski performance may not be caused by his high hemoglobin. I know that Peo was very much in favour of the idea that his hemoglobin was the reason or his performance. Nobody measured the cardiac output of Mäntyranta, I think. About people who have high hemoglobin concentration at rest, they may have low cardiac output at maximal exercise for other reasons than viscosity reasons. I can say that we found two runners from the Stockholm area who had the same problem as Mäntyranta, so we measured cardiac output in one of these guys and he had fairly low maximal cardiac output, but he had reasonably good oxygen uptake. So there are some strange things going on in the oxygen transport chain. Ekblom may be on the right track in his skeptical account and there might be other factors explaining the success of the Finn and it is noteworthy that Mäntyranta had good genetics regardless of his high hemoglobin and his nephew Pertti Teurajärvi was an international caliber level cross-country skier who won many medals as a part of the Finnish cross-country relay team, most notably the 1976 gold medal at Innsbruck Olympics. Even when some authors such as author David Epstein (author of The Sports Gene) have stated that he had the same blood phenomenon as his uncle had, this is not the case. Despite all the media fuss about him, there is very little we know about his aerobic capacity. But as one interesting anecdote, his Vo2Max was discussed in passing in 1971 when he was trying to return to perform at top level for the 1972 winter Olympics and it was mentioned in passing that his Vo2Max had been measured with direct methods only once, in 1965. Case closed on the timeline? If the reader wondered why the essay is titled “a genesis” and not ”the genesis”, it is because there could’ve been other paths to innovate the method. In fact, the narrative described in this essay on how blood doping became ”invented” is prone to reevaluation even far in the future if and when new information emerges. It is also difficult to pinpoint a moment when something is ”invented”. Blood doping wouldn’t even be the only hemoglobin concentration – related item that might’ve earlier than widely assumed. Even when there is a lot of truth in the claim that exercise physiologists James Stray-Gundersen and Benjamin Levine invented the so-called “live high/train low”- exercise method in the 1990s, one could argue that the idea was “really” invented some two decades earlier. Because blood doping researchers Norman Gledhill and Alison B. Froese, in essence, noticed the detraining-problem some fifteen years earlier in their essay. The study they refer to where these shortcomings were avoided was published in 1980 and the preliminary report in 1976. If one looks for trails of the idea of intermittent hypoxia even further in time, the idea is mentioned before the 1968 Olympics in a transcript of a discussion that took place about high altitude training between the scientists from nordic countries. ”There is one interesting aspect which is not clearly answered as yet, and that is the effect of intermittent living on a high altitude”, physiologist Kaarlo Hartiala mentioned in passing in 1966 when discussing the matter with his nordic colleagues. “It might be to some benefit to keep the training on a lower and the living on a higher altitude”. Still, it took until the 1990s before the Stray-Gundersen and Levine ”invented” the idea and gave it the scientific validation. About blood doping, the situation is slightly different because there is some smoking gun research, but in addition, there is also some gossip and evidence about the method actually been used before the 1970s and it is possible to locate some references of athletes having blood doped before the 1970’s even in academic publications. One theory actually is that Ekblom, Åstrand, Goldbarg and the others only gave the scientific validation to the method already in use. The case that the GIH-scientists knew about the benefits of blood doping before Björn Ekblom started the research around 1966 is a possibility but still somewhat unlikely one because why would Bengt Saltin have discussed transfusions publicly in 1965 if administering transfusions was the exclusively secret weapon of the Swedes? And why were there many foreign researchers involved in the research and why were the findings discussed as early as 1966 with some 200 nordic physiologists possible hearing about the line-of-inquiry even if the results were inconclusive at best? “Real” blood doping isn’t the only reason to conduct transfusions in exercise physiology/sports context even they all are lumped technically together in the modern mind and in the current anti-doping regulations. If there is one lesson from this lengthy essay, it is that all transfusions aren’t created equal and even if individual athletes had been administered transfusions, it didn’t necessarily mean that the rationale was to ”blood dope” in the same intellectual tradition that later (1971-) athletes performing similar operations did, because anemia was a medical condition treated with transfusions and it could’ve been used for altitude adaptation. It is still noteworthy that the gossip about these pre-1970’s transfusions are a few in number and later impressions of teammates and competitors can be deceptive. If one also follows the roots of many known blood doping circles, the roots are usually one way or another traceable to the research conducted at the GIH. The Finns were aware of the Swedish research on some level by the late 1960s and endurance running coach and anti-doping activist Alessandro Donati has also claimed that the Italians didn’t ”know” about blood doping all along but started their research on the subject in the 1970s. If they had known it all along, why reinvent it again? As far as I know, this has been a first deep look into the origins of blood doping, which is somewhat surprising, considering that the blood doping research at the GIH began over fifty years ago, and the first published research paper on the subject was published some forty-seven years ago. The reason might be that the method of blood doping is so simple and tautologically true that many commentators looking the subject with the modern knowledge erroneously assume that there was not that much to be researched at all in the subject and correspondingly there was barely any debate at all about its efficacy. If the first blood research paper published in 1972 was an interesting and somewhat unpolished paper on an arena not much researched before, opening the subject for further interest, I do hope that this essay will serve somewhat similar purpose for the subject of the history of blood doping, stimulating intellectual curiosity for “real” historians and researchers either to confirm or debunk my findings and conclusions and to pursue new avenues of research. Regardless of what the response will be, I do hope that I’ve done justice for the research work that took place at the GIH and elsewhere many decades ago about the topic. And when I have a huge respect towards Björn Ekblom, I do hope that I’ve proven him wrong when he once remarked that only a physiologist understands the research they are doing. The author wishes to thank Dr. Björn Ekblom without whose help this essay would not have been possible and also Alex K. and Chelsea L., both of whom went through parts of the first version of the manuscript and corrected grammatical errors and made some improvements into the structure. This is part five of a multi-part series titled “Limiting Factors – A Genesis of Blood Doping”. The full bibliography for this research can be found at the end of Limiting Factors – A Genesis of Blood Doping (part one).